Uday Verma drove his rented U-Haul across the United States border to Canada in September. His mostly-Corgi rescue dog, Dora, was his copilot. He had set out to build a new life in Toronto working for Kira Systems as a software developer; his wife and son flew to meet him. Verma came to the U.S. in 2006 from India to pursue his master's degree in computer science at the University of Iowa. 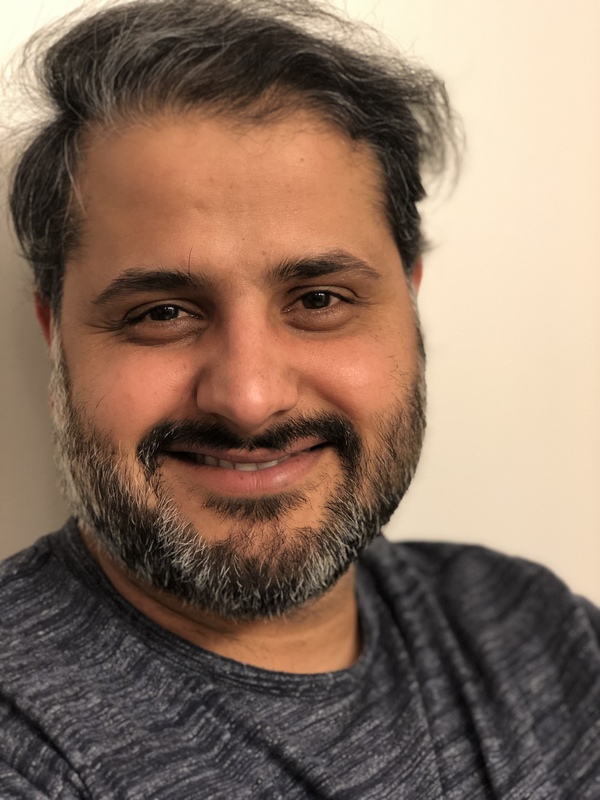 After graduation, he used his extended practical training F-1 visa to work at Interlink Network Systems Inc. Around that same time Verma and his wife had a son and in order to extend his stay and work, Verma required an H-1B visa. The H-1B visa program allows foreign nationals, some of whom are educated in the U.S., to receive work authorization and remain in the country. With the associated H-4 visa, spouses and children under 21 can reside in the U.S. too. Uday Verma, a software developer at Kira Systems who previously worked and lived in the U.S. under an H-1B visa. H-1B renewals can create pathways toward permanent residency, allowing many to build lives in America; to marry, purchase houses and cars, have children and pay taxes. The U.S. boasts the most college-educated immigrants in the world, according to a recent study from the Pew Research Center showing data from 2015. The U.S. has 14.7 million immigrants with a postsecondary degree, eclipsing the next closest country, Canada, which has 4.4 million. The attitude toward immigrants has shifted in the U.S. under President Donald Trump and the "Buy American, Hire American" executive order. The filing process has become more difficult to navigate for petitioners and employers, with close scrutiny of previously routine H-1B applications. The administration says it's adjudicating the petitions fairly and efficiently, working on a case-by-case basis. It's becoming harder for people like Verma to remain in the U.S., with policies curtailing paths to residency. He received his first H-1B in 2009 and the visa requires renewal every three years. It was renewed again in 2012 and 2015, but by that time Verma had already applied for his permanent residence and passed all the labor certifications, he told CIO Dive in an interview. Based on the met requirements, Verma could indefinitely renew his H-1B. "Usually you shouldn't need to, but it's kind of like particularly messy for people from India to get a permanent residency in the United States," he said. In 2018, his H-1B was up again for a renewal, "but the political climate had changed and my opinion of the process had changed." Verma was met with uncertainty. He was up for renewal, but was hesitant to put his family through the process. Though 10 years older, "I was like, I still feel like I just landed from India," he said. Though unlikely, if he was fired from his job, it would throw him back to square one. After years in the H-1B program, all that Verma had built — a career, friends, family, life — did not guarantee he would get to stay in the U.S. So he and his family left. Computer-related occupations dominate the H-1B program. In FY 2017, almost 70% of petitions went to the field, according to USCIS data. And more than three-quarters of petitions are from India. The next closest country of birth, China, accounted for 9.4% of petitions in FY 2017. "People who are born in India, for example, may wait nine years to get a Green Card," said Michael Nowlan, an attorney working exclusively in immigration law with Clark Hill. "To hit them six years in and say, we've decided just to kind of change our interpretation of something, we've decided to deny your H-1B ... it's more than unfair, it's cruel." With another H-1B filing season opening on Monday, a lottery will decide whether some foreign nationals can work in the U.S. The cap — which allows for 85,000 petitions — favors those who have a master's degree or higher from U.S. schools. Once accepted into the cap, petitioners will have to wait through a lengthy adjudication process. "I think there's a lot of anxiety because the foreign nationals are seeing in chat rooms and on [the USCIS] website that there's more denials, more requests for evidence," Nowlan said. "You can try and take stock in your own sponsor, in your own skills, but it is kind of a nameless faceless agency, so you don't really know what's going to happen." Under the Trump administration, the H-1B program has become more difficult for companies and foreign nationals to navigate. Policy changes and tweaks to the adjudication process have left petitioners in a lurch. The H-1B program is "a mess," said Neena Dutta, principal attorney at Dutta Law Firm, in an interview with CIO Dive. Under the regulation, USCIS has not "actually changed a huge amount," said Dutta. But internal policies are acting like "death by a thousand paper cuts." 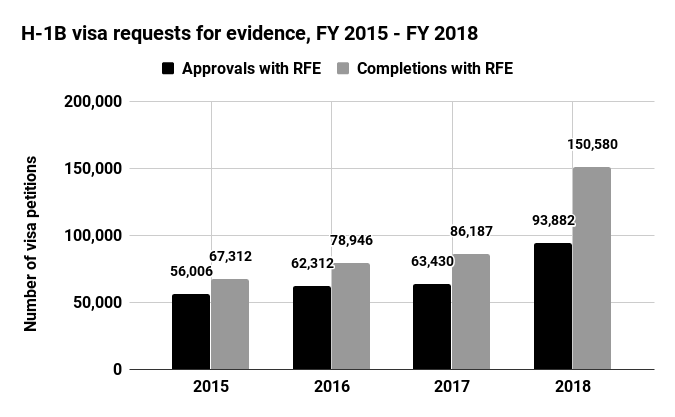 Chief among the difficulties navigating the filing process is an uptick in requests for evidence (RFE). USCIS, however, says the agency is pursuing its mandate to uphold immigration laws and protecting the wages and working conditions of U.S. workers. "USCIS will continue adjudicating all petitions, applications and requests fairly, efficiently, and effectively on a case-by-case basis to determine if they meet all standards required under applicable law, policies, and regulations," said Jessica Collins, USCIS spokesperson, in a statement to CIO Dive. Immigration lawyers are seeing RFEs for "extremely boring cases," which creates "new and novel issues for employers and the foreign nationals," said Nowlan. It feels like the RFEs come with a "gotcha attitude." A mechanical engineer who has a degree in mechanical engineering and is applying for an H-1B to work at a mechanical engineering company would receive pushback and RFEs. "That creates a tremendous amount of anxiety for the foreign nationals, it creates additional cost for the employers," Nowlan said. "And, again, we're talking about cases that are squeaky clean from a regulatory and historical perspective." One of the principal concerns is that program changes are eliminating the predictability for how businesses navigate U.S. immigration to bring in — and keep — foreign national talent. Before, lawyers could tell clients estimated start dates for a petitioner, said Dutta. But now it's difficult to assure employers talent will be available. "It's just disintegrated to the point where lots of lawyers are telling people not to file at all," Dutta said. Denials come with RFEs; and loss of work authorization come with denials. 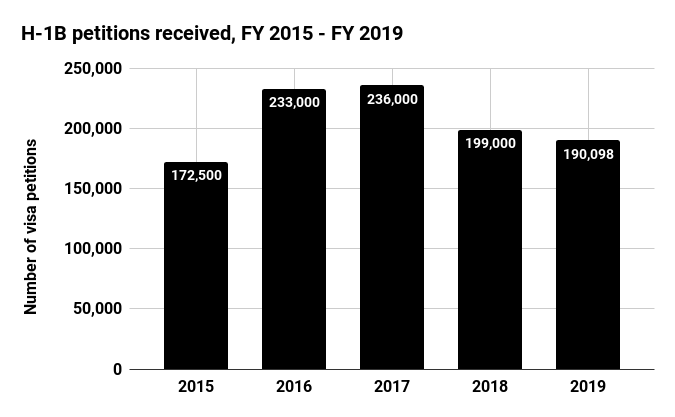 The rate of denials for I-129 nonimmigrant worker petitions — a category including H-1Bs and other petitions for temporary foreign workers — increased almost 35%, from 16.8% in FY 2016 to 22.6% in FY 2018, according to USCIS data analyzed by the CATO Institute. If H-1B petitioners lose their visas, they lose their ability to work in the U.S. And while a petitioner can appeal, they cannot remain in the U.S. while the case is pending, according to Nowlan. This also happens to people who have resided in the U.S. for years and are seeking an H-1B extension or change of employer. Though some adjudication policies have changed, the H-1B program has the same number of petitions available in the lottery each cap season. Other associated visas face disruption. USCIS has proposed to remove work authorization from the H-4 visa. Eliminating work authorization visa would have a direct economic impact on H-1B visa holder families. And for some, could motivate looking to other countries for work. "USCIS continues reviewing all employment-based visa programs, including H-4 EADs," said Collins, in a statement to CIO Dive. "No decision about the regulation concerning the employment eligibility of certain H-4 spouses is final until the rulemaking process is complete." While the Trump administration has espoused the need to buy and hire American, people in the U.S. overwhelmingly support high-skilled immigration. A recent study from the Pew Research Center found eight in 10 U.S. adults support the immigration of highly-skilled people to the U.S. Of those who say the U.S. should allow fewer or no immigrants, 63% still support high-skilled immigration. The U.S. unemployment rate is 3.8%; the unemployment rate for professional, scientific and technical services is 2%, according to data from the Bureau of Labor Statistics (BLS). Coupled with the low unemployment rate are a high number of job openings. BLS data released in March recorded 7.6 million U.S. job openings at the end of January. But only 6.3 million people are looking for work. With low unemployment rates and millions of job openings, macroeconomic decisions can increase the push for more immigration, said Richard Burke, president and CEO of Envoy Global, a firm which helps companies and workers navigate global immigration and visa processes. "Zooming in on tech and STEM, U.S. colleges and universities are not graduating enough U.S. citizens with STEM degrees, but demand for tech jobs continues to increase," said Burke, in an interview with CIO Dive. "You've got this yawning gap where there's not enough supply for the demand," which pushes companies toward foreign talent. Almost half of employers say the U.S. visa application process has become more difficult, citing an increase in RFEs as a contributing factor, according to a recent Envoy report, which surveyed 400 human resource professionals and hiring managers. Canada, in particular, becomes alluring for companies; 65% view Canada's immigration policies as more favorable than the U.S. and many already have an office or are considering an expansion in Canada, according to the report. Software demand is driving multinational firms to shift research and development overseas to countries like India, China and Israel. Growing new talent hubs can lessen the burden of the talent wars and create an outlet for companies navigating immigration policies. Microsoft has warned it may shift jobs abroad as a result of U.S. immigration policies. Its Vancouver, Canada-based development center could act as a "safety valve" for Microsoft, said Brad Smith, Microsoft's president and chief legal officer, in July. Microsoft is not alone. Canada's immigration policies are intended to attract more tech talent. Launched in June 2017, Canada's Global Talent Stream program expedites the visa application process for high-growth companies, reducing processing times from six months to 10 business days. Whether in IT or not, the program speeds up the application process for highly-skilled workers, said Jacqueline Bart, a Canadian immigration lawyer, in an interview with CIO Dive. Workers can also bring their families under the program. The country wants to bring 350,000 foreign nationals in each year through 2021. Bart has processed more non-renewable H-1B cases where U.S. counsel says there is nothing more they can do for the workers. "Let's face it, H-1B holders tend to be young, they tend to be fluent in English and they tend to have a master's degree and along with a baccalaureate degree and quite a bit of excellent experience," said Bart. "That's a very desirable skill in terms of our Canadian assessment process. That kind of criteria lends itself to quick routes to immigration to Canada." Verma went to Canada as part of the Global Talent Stream. Canada was once considered his family's fall back plan, but it morphed into a permanent option. He already applied for permanent residency, which is merit-based. The average processing times is max six months for express entry, Verma said. He expects to hear back by the end of May. Quick routes to permanent residency — and even Canadian citizenship within four years — can keep workers in the country. In Canada, Verma has a new life and his anxiety is way down; life is more relaxed there. "Work culture wise, things are a little slower here," but not in a negative sense, Verma said. "In the U.S. everything I did was due yesterday. That's what I've gotten used to. Unless you tell me that the work I'm doing is for yesterday, that's what drives my work ethic that I have to get this done, which is not as much of that here." Even with concern over H-1B program's adjudication and difficulties receiving a visa, the program remains oversubscribed; demand still far outpaces supply. Each year the number of H-1B petitions received more than doubles the 85,000 visa allotment. Each fiscal year, H-1B demand far exceeds the demand for the 85,000 visa petitions. "I have no doubt that there are individuals who ran into a bureaucratic problem and said the hell with the United States and went," said Steven Camarota, director of research, at the Center for Immigration Studies, in an interview with CIO Dive. The U.S., however, remains attractive because of its efficient capital markets, leading universities, tolerance and a low tax environment when compared to other industrialized countries. "When you step back and look at the big picture, you understand why the line waiting to get into the United States — legally or illegally — is vast," said Camarota. "And that's not likely to go away anytime soon." The concern for many is the pipeline moving forward, particular for high-skilled and educated workers. It's "incredible the need for countries to attract highly skilled talent," Bart said. "Countries that are not competitive, that are not really taking the time to develop programs that are attractive to foreign workers are really being left behind and right now the U.S. is being left behind."